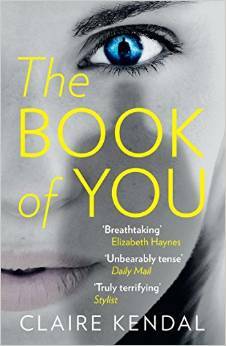 I was lucky enough to be sent a copy of ‘The Book of You’ to review by the guys at Mumsnet. “A terrifying psychological thriller about obsession and power, perfect for fans of Gone Girl and Before I Go to Sleep. From the outset I really enjoyed this – way more than Gone Girl – and mostly because you actually care about Clarissa and what is going to happen to her. The book has some chapters written in the first person, almost as diary entries – and others in the third person. I’m not sure it particularly adds anything to the book – but equally doesn’t distract. It is very clever writing about Clarissa being stalked, but weaving in the plots of other women having similar issues. It makes you realise how difficult it can be for stalking victims to be believed. At times I did just want to shout at Clarissa ‘for goodness sake, please tell someone what’s going on’ – but you can understand how she wanted to gain enough evidence to be believed. It really is a ‘just one more chapter, suddenly it’s 1am’ kind of book! The book also cross references a number of fairy tales – I didn’t realise how dark some were – frightening. Think I’ll stick to the mainstream ones with my kids. The ending is not what I expected at all – but I really respect Claire Kendal for that. I can’t say any more without giving it away – you’ll just have to read it yourself – and I would thoroughly recommend that you do! I’m intrigued – I don’t really read thrillers that often but when I do I like to be gripped by them, and this sounds like it would do just that! I’m a new convert to thrillers I have to say – but this one is great! Enjoy! I felt a bit cheated by the ending, half wondered whether some pages were missing from my copy! No idea how it could have been different though. Wandered across from the Mumsnet linky. Thanks for wandering across! I know what you mean and I swung between wanting to grab her by the shoulders and getting her to call the police, and then realising how she wanted to get all of the evidence. It would have been very easy to have a twee and predictable ending – so I quite liked that it didn’t! !